A Gay Housewife not only keeps the house filled with love – he also keeps the place standing. Paint, polish, patch, and repair to make it nice – and keep it nice. A Gay Housewife refuses to sacrifice elegance for frugality. Anyone can spin straw into gold at home with new and tried-and-true ideas about maintaining standards, trimming the fat, and investing wisely. No matter what you’ve been told before now, marriage involves taking care of another individual and a willingness to be cared for. In that way, all marriages are created equally. A Gay Housewife inspires others to truly value their spouse. A Gay Housewife celebrates fit, active families and promotes good health through food, excersize, and a fun, positive sense of adventure outdoors and in. The kitchen is the heart of the household. A Gay Housewife uses a realistic balance of fresh, natural ingredients and supermarket staples to turn healthy meals and snacks into the gourmet favorites that the whole family loves. If, as the old saying goes, cleanliness is next to Godliness then the Lord loves a Gay Housewife. Create space where there is none and vanquish wasted and repeated effort through the art of organization. A Gay Housewife uses the colors of art and nature to create a haven in a mad world. Decorate and design with passion using secrets from Gay Housewife’s experience at home and in the advertising and design jungle. 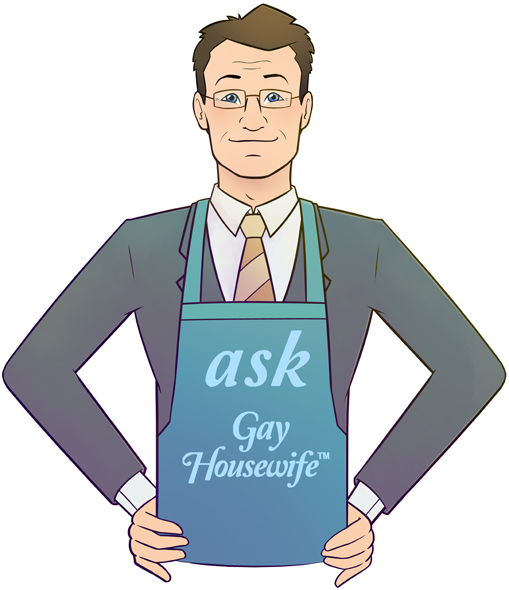 Gay Housewife answers your questions here. Submit your question for Hank Donat, aka Gay Housewife. Hank welcomes reader questions about his unique approach to marriage and domestic arts, in addition to his views on marriage and civil rights. Ask away, or feel free to share a tip or talent of your own with GayHousewife.com. 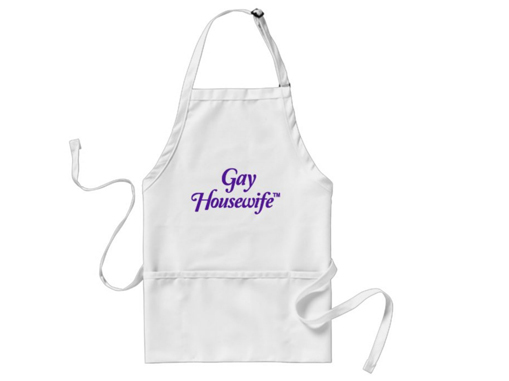 Show your support for housewives everywhere with Gay Housewife® and Make it nice.® merchandise from GayHousewife.com! Gay Housewife T-Shirt. Sizes S, M, L, XL. $20. In GayHousewife.com, Hank Donat shares his recipe for cultivating a happy spouse and a loving, nurturing home. As equality for gay spouses becomes a reality, Hank demonstrates that the art of marriage transcends discrimination. Find insights from a Gay Housewife® on food, entertaining, art, decorating, and more. Says Hank, "You don't have to be perfect to be a perfect spouse. It only takes a bit of love to make it nice." 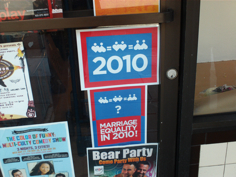 Journalist Hank Donat and his husband, Jeff Halpern, became San Francisco's first gay grooms on June 17, 2008. 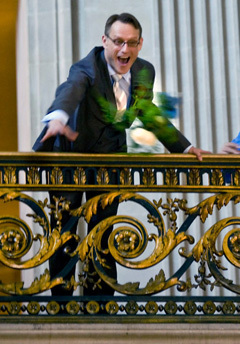 Hank triumphantly tossed his wedding bouquet from an ornate balcony under the rotunda at City Hall. "Lawful marriage to the perfect partner is Paradise on Earth." As captured in an iconic image by New York Times photographer Peter Dasilva, the historic event helped usher in a new era for the City and for Hank, the longtime online ambassador known as Mister SF™. While the world was listening, Hank declared, "Taking care of the person you love is the most important thing in the world - gay or straight." As a Gay Housewife, Hank often faced ignorance about the perceived role of a spouse and partner. Now he leads by example, bringing the same optimistic outlook and attention to detail to his adventures around the house that he brings to his exploits around town. Always at the epicenter of history, surrounded by the magic of San Francisco, Gay Housewife Hank Donat continues to enumerate the rewards of marriage and homemaking.